I cooked lumpiang shanghai the other day following Riz’s style of adding tofu or tokwa to the mixture as meat extender. Mixed all the ingredients together except for the egg white. Place a teaspoon of the mixture at the center of the wrapper. Fold over and moisten the edges with white egg to seal it. The egg white keeps the lumpia crispy. Use paper towel to absorb the excess oil. I run out of paper towels so I used pandesal paper bag for a change. 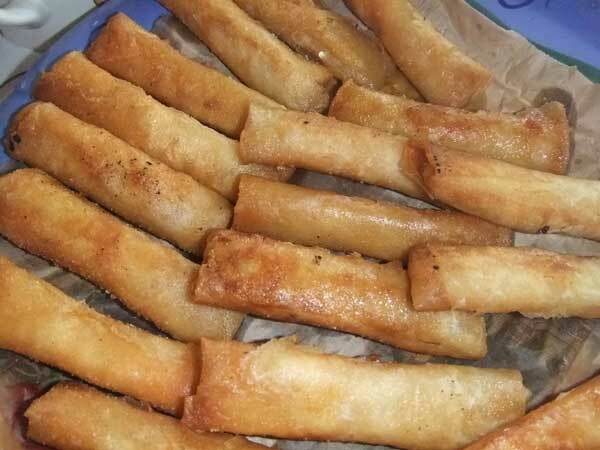 This entry was posted in Favorite Food and tagged lumpia, lumpiang shanghai, lumpiang shanghai recipe on June 18, 2011 by Yami.